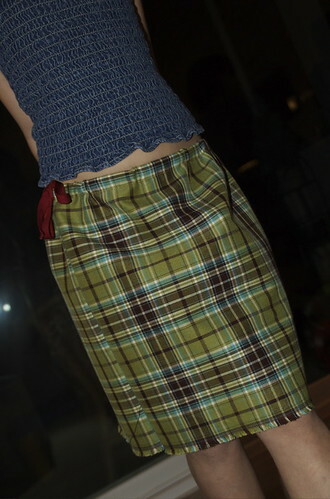 Plaid Skirt!, originally uploaded by VeroC. Next up on the party list was a skirt for Miss M.
The fabric had a nice fringe on the finished side so all I did was cut it to the length Miss M desired (adding a couple inches for the waist-band). We ended up sewing just two straight lines (I could handle that!). First the waist, folded over about an inch to accommodate an elasticized ribbon. Second the length. The last step was to thread in the ribbon. Voila! I highly recommend using checkered, or striped fabric if you are a novice seamstress like I am — all you have to do is sew along the lines! After twirling around in a bit, my girl informed me that I had to blog this. She also thought I should "do this for work." I am so relieved it worked out, I was terrified to mess this one up. Note to self: perfectionism isn’t worth the stress.